A variety of factors unique to this election cycle contribute to a voting environment where voters have reason to believe they will be met with intimidation at the polls, accompanied by a very real fear of violence due to the color of their skin or their age. We urge you to investigate possible violations of federal voting rights laws and intervene where necessary to protect voter rights. A major party candidate is calling for voter intimidation at the polls based on race and age. The threat of voters being met with possible violence from white supremacists and law enforcement at the polls could lead to substantial voter suppression on Election Day. 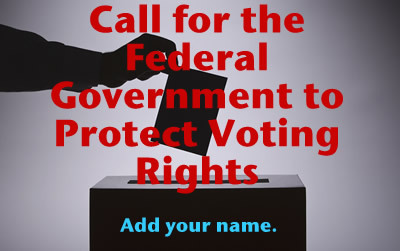 Due to the far-reaching nature of the call for voter intimidation of people of color and young voters, it is necessary for the federal government to take action in order to protect voters. 16248 2.2 years ago Coleen Anderson Yakima, WA The Survival of Democracy requires the protection of voter rights. 16243 2.2 years ago Dwight Hilpman Lawrence, KS Nothing is more important! 16241 2.2 years ago Kay Warren Espanola, NM Protect & assure voting rights. We must do at least this. 16239 2.3 years ago Ken Gale NYC, NY Democracy may be an imperfect system of government, but it's a lot better than what we have now. By taking action you agree that you may receive future alerts from one or more of: RootsAction, Liberty Tree Foundation, Move to Amend. We consider your contact information to be private and confidential. We will NOT disclose it to any other entity unless you specifically authorize us to do so. You can unsubscribe at the bottom of any email you receive from us.